Fresh and modern with the casual sophistication of today's design, the Mele & Co. Misty glass top jewelry box makes a sublime presentation. Featuring an ample ring roll section, chic linen weave lining and an elegant grey wood grain finish, this jewelry chest is simple, yet sumptuous. 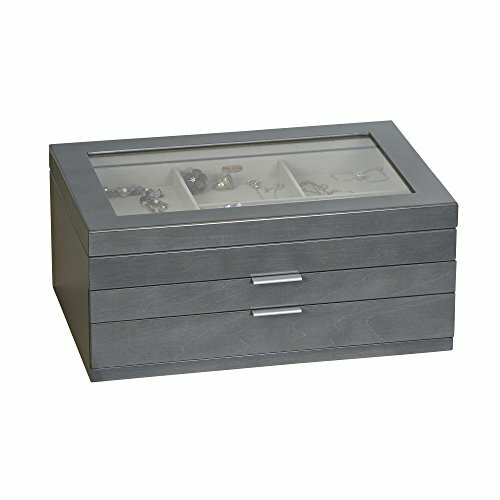 Oceanside Grey finish glass top wooden jewelry box. Lift lid with clear viewing window. Top compartment features a large ring roll section, large full depth open area section and two smaller equally sized sections. Two drawers. Top drawer offers four equally sized sections. Bottom drawer offers open area storage. Hand lined in natural color linen weave fabric. Brushed metal silver tone drawer pulls and compass hinges. Features Mele & Co. logo plate inside. 15" x 10" x 6 1/2". OCEANSIDE GREY FINISH. Cool wood grain finish offers sophisticated style. 2 DRAWERS. Divided and open storage gives you freedom to arrange your jewelry as you please. LINEN WEAVE INTERIOR. Hand lined interior protects your jewelry from scratches and abrasions. BRUSHED SILVER TONE HARDWARE. Contemporary details keep the style fresh.